- An option to opt-out of Google Analytics on this website. - Cookies usage banner that notifies website visitors about the usage of cookies on your website. iv. WooCommerce product reviews forms. This service is completed within 3-4 business days. Improve your website's default protection with the set of professional tools suggested by TemplateMonster experts. 1) MySQL Database tweaks that will secure your data from standard hackers' attacks. 2) Installation of Security Module that will protect your website from hackers' attacks of various types (SQL Injections, Remote URL/File Inclusions, Remote Code Executions and XSS Based Attacks). 3) Installing CAPTCHA to protect the forms on your website from spam. That includes Login form, Lost Password and/or Username form, Registration form and Login to admin panel form (Joomla 3+ has own Captcha). 4) Encryption of your admin panel password (alternative to SSL). Unless you use SSL, a user logs into Joomla sending his password in plain text across the network by standard. We will secure it. Secure package will be provided by our Service Center. Present your sports gear online shop in a new way with Godeex theme. You will be able to show products by categories, brands, and popularity in the most convenient form. This theme has a modern design and powerful functionality. You will customize your website according to your requests and vision using a strong Jet plugins bundle for Elementor page builder. JetWooBuilder and WooCommerce plugins are a perfect combination for creating a professional eCommerce website easily and quickly. With JetThemeCore plugin you will create custom headers, footers, and special sections, moreover, it will be possible to select pre-made sections on an appropriate topic and insert them into the pages in a few clicks. JetTabs plugin will assist in organizing the content into attractive tabs and accordion blocks without any coding knowledge. JetProductGallery plugin will allow showing the images of the products in the form of the alluring gallery. Using JetCompareWishlist plugin you will add comparison and wishlist functionality to your website. JetElements plugin is a useful plugin, which provides a lot of widgets for enriching the content. 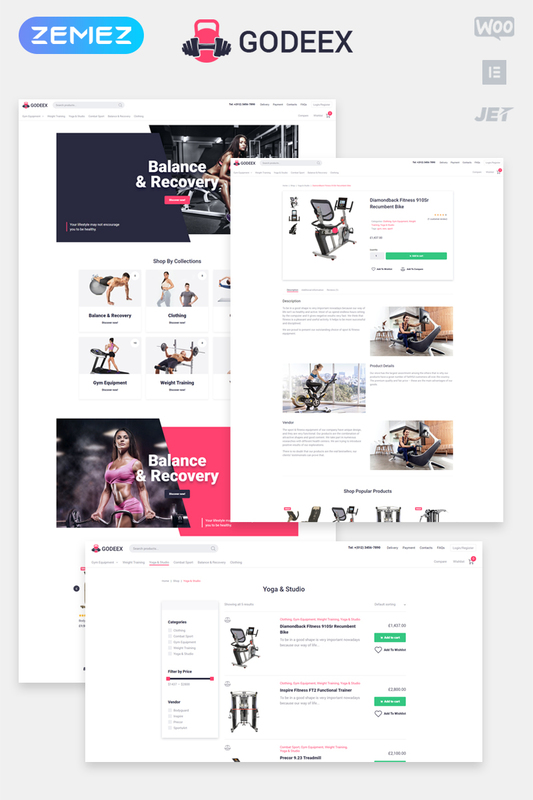 Godeex is a fully responsive and well-structured theme, which will help to engage more visitors and potential customers to your sports gear online store.